LegendDisplayMode - this series.Appearance property will define what will be shown in the legend for each chart series. The valid values are from the ChartSeriesLegendDisplayMode enumeration. 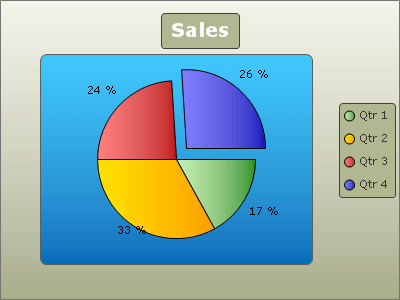 ItemLabels - the legend will display an item for each series item (the preferred setting for pie charts). Note, that although it is ItemLabels, the legend will actually display the value of the item Name property, thus providing means to show a different information from what is shown in the item labels.